Do you ever just get into your car and think, “How did this mess happen?” Maybe its crackers or dried up fruit snacks in the back from your toddler, or lost homework from your teenager, heck maybe it’s your old gym clothes or other belongings. In a way, your car is like a second home especially if you spend a long time commuting in Austin traffic. It’s very easy for your vehicle to become cluttered or messy. 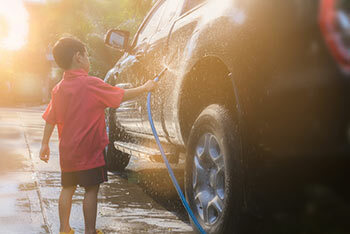 While you’re spring-cleaning your home, don’t neglect your ride! Check out these organizational hacks for spring-cleaning your Chevrolet. One of the worst places to clean in your car or truck is definitely the cup holders. It’s a big sticky mess! Loose change can get stuck to spilled drinks or general dirt and dust collect in there. This is by far our favorite hack and you likely have these in your household pantry already. Use cupcake liners inside the cup holders. This hack is unbelievably inexpensive and totally practical. Shoe organizers aren’t just meant for the closet or the back of your bedroom door anymore. You can hang these on the back of your car’s seats. This becomes great storage for umbrellas, smaller sized items, or your kids’ toys. They are also perfect in the spring and summer because you can keep sunscreen in there without fear of having a mess inside your vehicle. Have your allergies been out of control with all the spring flowers blooming? Well, then this is the hack for you! To clean the vents inside your vehicle, use a foam craft brush. It fits perfectly within the vents of your car or truck without damaging them. You can find these brushes at any craft store and at most dollar stores. Speaking of allergies, there is nothing worse than digging in your glove box for a drive-through napkin to blow your nose. No place for the tissue box? You can use a disposable coffee cup as a tissue holder that fits perfectly in the cup holders. Spring is the perfect time for going on picnics with the family or take the boat out on the lake. For all the towels or blankets that you’re sure to use, keep a laundry basket in the trunk to keep them all in one place. For a year-round hack, keep a laundry basket in your vehicle to hold groceries or other items after you shop. Not only will it be easier to carry everything inside, but also you won’t lose or misplace any of your shopping items. We hope these hacks keep your Chevy clean and organized this season!